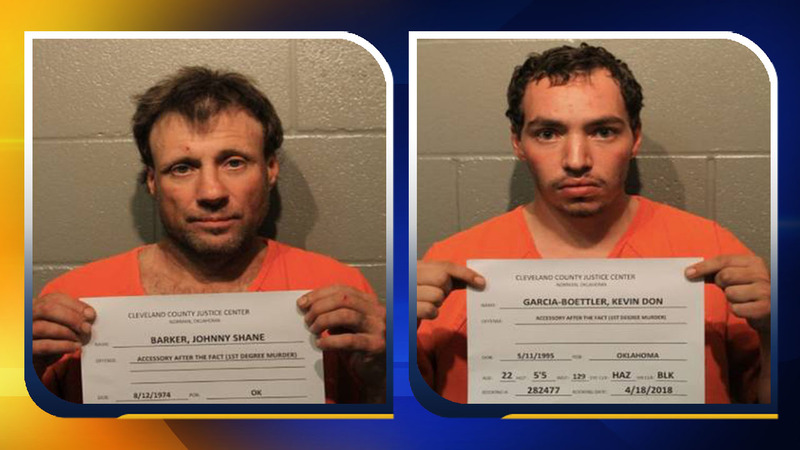 MOORE, Okla. -- Charges have been filed against four people in connection with the deaths of two men, whose bodies were pulled from a pond after they were reported missing in Oklahoma, officials said. According to Moore police, Alize Ramon Smith and Jarron Keonte Moreland, both 21, went missing on April 14 after a shooting in the parking lot of a Crest Foods near 12th Street and Eastern Avenue. On April 28, police confirmed that the men's bodies were found in a pond near Northeast 50th Street and Sooner Road, KOCO reports. Boettler's brother, Kevin Garcia-Boettler, 22, has been charged with accessory after the fact and unlawful removal of a dead body. Boettler's mother, Crystal Rachelle Boettler, 40, has also been charged with accessory after the fact. According to court documents, detectives found the White Chrysler Town and Country van which was seen during the shooting, at the Boettler home. After looking inside, they found "cleaning products and a power washer around the vehicle," "dried blood spatter on the ceiling of the van" and "a bucket of water with a chainsaw bar inside and soaking in the water along with several jigsaw blades." Court documents state after fleeing the scene with the bodies, the brothers headed to their mother's house where her boyfriend, Johnny Shane Barker, allegedly helped them remove the bodies, cover them with tarps, and attached cinder blocks around them with chains before dumping them in a lake. The probable cause affidavit states that the bodies were also dismembered. Kevin admitted to disposing of the bodies and Barker admitted that he helped with cleaning the van to prevent any evidence being detected.